Marriage customs of muslims in Sri Lanka vary among their different communities. 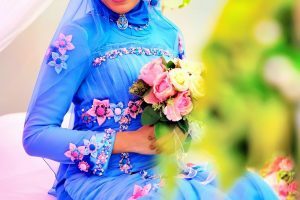 The Malay community usually follow typical Malaysian and Indonesian customs whereas the Borah and Mayman communities almost follows the Indian and Pakistani customs and the Moor wedding customs are significantly different from the above all. Nikah ceremony is held in a mosque (most often after the late afternoon prayer) in the presence of the Guru (the muslim registrar of marriages ) and the male relatives of the bride and groom , in addition to the other devotees.The wedding ring is slipped to the groom’s finger by the bride’s father. 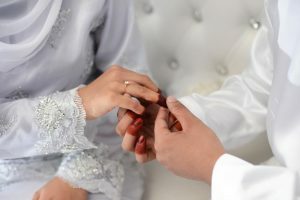 Some even have the nikah ceremony at the venue of the wedding reception.After the registration of the Nikah the groom has to give a Mahr payment which is a token of gift from the husband to the wife. This is a compulsory gift which could be given either in cash of kine. It is compulsory that the groom should mention the word Mahr when handing over this gift for it to be valid. Bride and groom are blessed by their elders in their respective residences before they leave for the wedding reception. Bride enters the venue of the wedding reception and sits on the throne before the arrival of the groom. The groom is greeted at the entrance of the venue by an elderly male relative of the bride by offering Alaththi and thereafter occupied to the throne by the bride’s father. At the throne the groom ties the necklace on the bride and also slips the wedding ring . The couple thereafter salaams (greetings) to each other. Within a week of a wedding the “Waleema” is held. This function is hosted by the bride groom. 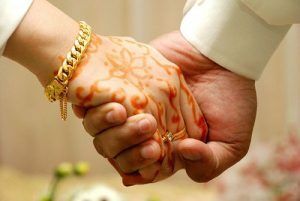 Waleema signifies that the groom has become a part of the household.